The greatest pressure for any emerging artist must surely to be to get product out onto the market: something to satisfy new fans and entice prospective fans. The urge to splurge material, whether ready or not, in order to strike while the iron is hot is more than most can resist. Nathassia is indeed a rare artist, and, it would seem, something of a perfectionist. Recording as Nathassia Devine, she had a 13-track debut album recorded, packaged, and in circulation to the press, finding favourable reviews (including one from me). That was 2014. The album was shelved. It’s now 2016, and a lot has happened. Having decided to pull back and regroup, restyling herself as Nathassia, she’s spent the intervening time reshaping her sound and building an enviable audience at home and internationally. Finally, she’s satisfied, and the end product is Light of the World. And yes, it was worth the wait. Cut back to 10 tracks, only four songs from the original album remain. Having honed her songs with the assistance of Bruce Elliott-Smith, Light of the World finds Nathassia exploring cross-cultural music evermore broadly and evermore confidently. Half Dutch, half Indian and residing in London, Light of the World is very much a 21st century hybrid of these very different cultural backgrounds. It’s an electronic album, but not one that confirms to any one strain or style, leaping hither and thither and picking, magpie-like, from a host of musical strands. Nathassia’s striking appearance is the perfect visual representation of her sound, and embodies her mixed roots, as East meets West in a perfect amalgamation. But this is no mere marketing schtick: she is very much a self-made package, and one which has immense market appeal both visually and sonically. Contrast and juxtaposition lie at the heart of Light of the World, but rather than treat this yin and yang as conflicting elements, she embraces them and draws them together to intriguing effect. The sultry ‘Egypt’s Queen’ finds Nathassia rolling her r’s and accentuating the eastern influences of her music. Single cut ‘Turning Headz’ is more hard-edged and showcases a driving, drum ‘n’ bass orientated sound, something which wasn’t present on the original album, and similarly, ‘Parasite’ is driven by a grating bass and insistent, industrial-edged drumming. Melding insistent beats with snarling techno, it’s dark in hue, and paired with Nathassia’s keeningly exotic vocal delivery that’s tinged with a hint of venom, it’s a powerful piece. Elsewhere, the title track spins out an expansive, cosmic vibe, highlighting the diversity of the material on Light of the World. It certainly isn’t an album that works to a formula, and stands as a truly multidimensional piece. It helps, of course, that the range is matched by the quality of the material. 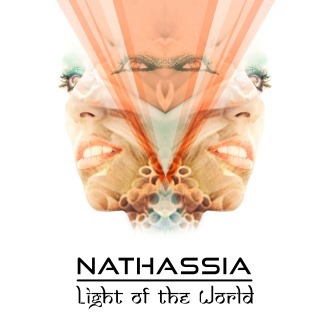 Light of the World is an album which not only reveals Nathassia to be a fascinating, chameleon-like songsmith and performer, but a distinctive and even unique voice.